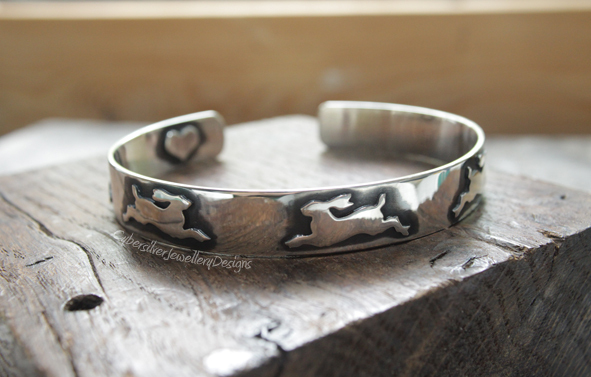 ﻿﻿A beautiful silver hare cuff, entirely handmade to my original design. 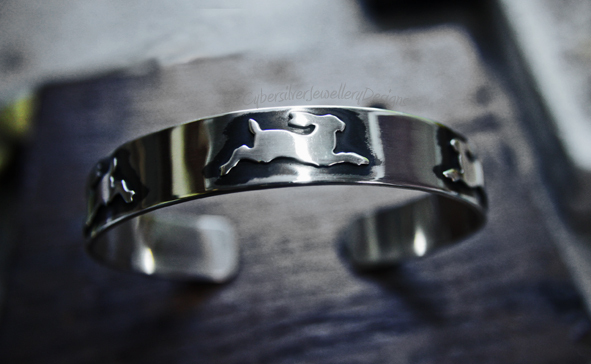 Constructed from thick sterling silver, this cuff features five meticulously hand cut leaping hares. Each has been individually soldered to the thick silver cuff. I have oxidised and polished the silver and then waxed with a special microcrystalline wax to help protect the oxidised surface. Your cuff will come gift boxed - perfect for giving. To calculate your cuff length, measure around your wrist and then add on 1/2" to 3/4" depending on whether you prefer a tighter or looser fit. This will be the total length for your cuff, including the opening.